The challenge to design a lift that will work in 40 degree weather and lift 15,000 lbs. of pipe casing, and roll the pipe off to a holding bay area. The lift also needed to serve the purpose of lifting used pipe from the same holding area and tilt the pipe onto a forklift to be removed. (2) customized T2 Tork Scissor Lifts with a high end load rating to accommodate the pipe being rolled over the end. 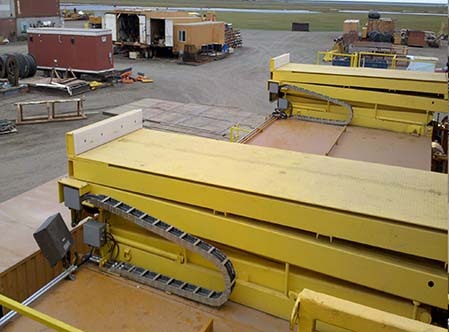 50 feet long pipe are rolled over the (2) lifts at a synced operation. Keeping the lifts level was also critical, so we incorporated PLC control flow valves that vary the hydraulic flow rate based off vertical measurement transducers. We also incorporated a 48″ shuttle into the platform to span the gap between the trailer and loading bay. The platform included retractable pipe stoppers, one on each end to keep the pipe on the lift until it is ready to be removed. Since the customer supplied their own power unit all the valves are mounted in a single location so the customer only had to hook up two hoses to run both lifts. Spec details include: Model# T2-120-200, 15,000lb capacity, Platform (60×196), Travel 100″, Hydraulic. Because of our extensive design experience and knowledge, we were able to deliver a high quality and durable lifting solution that was able to keep up with the tough demands of this application and environment.